China’s new retail market is expected to hit 1.8 trillion yuan ($264 billion) in 2022, continuing to play its role as a major driver in consumption growth. It is estimated that this sector will see a compound growth of over 100 percent in the next few years. The concept of new retail was created by Jack Ma, executive chairman of China’s e-commerce giant Alibaba, in 2016. His idea has been broadly accepted over the past two years. New retail’s contribution to economic growth was first confirmed by a twice-yearly economic report of eastern China’s city of Hangzhou, which is also the base of Alibaba. The report said that new retail accelerated the fusion of online and offline businesses, which meant the city’s three major appliance markets and ten major supermarkets saw a growth of 22.9 percent and 10.6 percent in sales volume respectively. The online-offline integration will enjoy huge potential in the digital era, and will inject new energy to consumption growth and economic development, said Zhang Xinhong, director of the Sharing Economy Research Institute under the State Information Center. On one hand, new retail is driving consumption upgrade; while on the other, consumption upgrade is also contributing to the rise of new retail. According to China’s National Bureau of Statistics, final consumption contributed 78.5 percent of economic growth in the first half of 2018. Last year was also the 14th year in a row that China has seen a double-digit growth in total retail sales of consumer goods. At present, more and more capital is flowing into this rising sector, and e-commerce and tech giants in China are all planning new strategies centered on this concept. 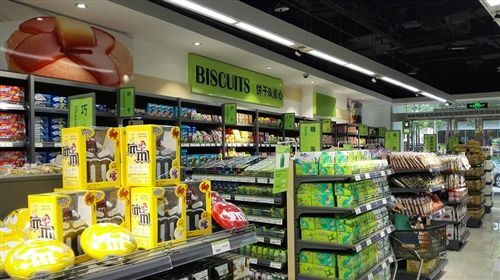 For instance, e-commerce platform JD acquired Yihaodian, Walmart’s e-commerce marketplace in China in 2016, and is planning to open over a million convenience stores across the country in the next five years. A report on new retail showed that the sector received as much as 155.5 billion yuan in investment from 2017 to the first quarter of 2018. 505 investments were made during this period with each of them averaging 366 million yuan, 1.6 times the industry average.